PARRY, WILLIAM E. (1790-1855). English explorer who established an arctic “farthest north” of 82 degrees, 45 minutes; a record which stood until 1876. ALS. (“WParry”). 1p. 8vo. Admiralty (London), October 23, 1838. 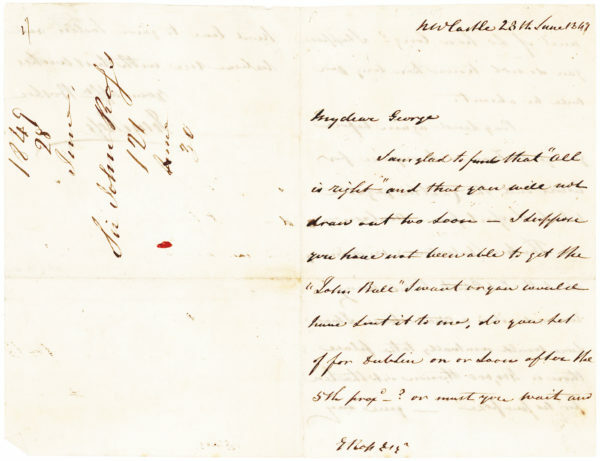 To JOHN BARROW (1764-1848), English statesman and promoter of Arctic exploration as second secretary to the Admiralty. 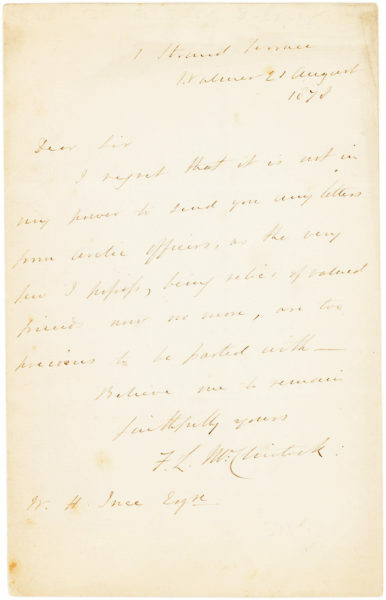 “I will immediately forward your letter to Mr. Stanley, who is in Ireland, with an earnest request that he will do what he can for Lowe. Parry joined the royal navy at age 13 and studied the astronomy of northern latitudes while stationed for three years in Spitsbergen, Norway, resulting in the publication of his Nautical Astronomy by Night. 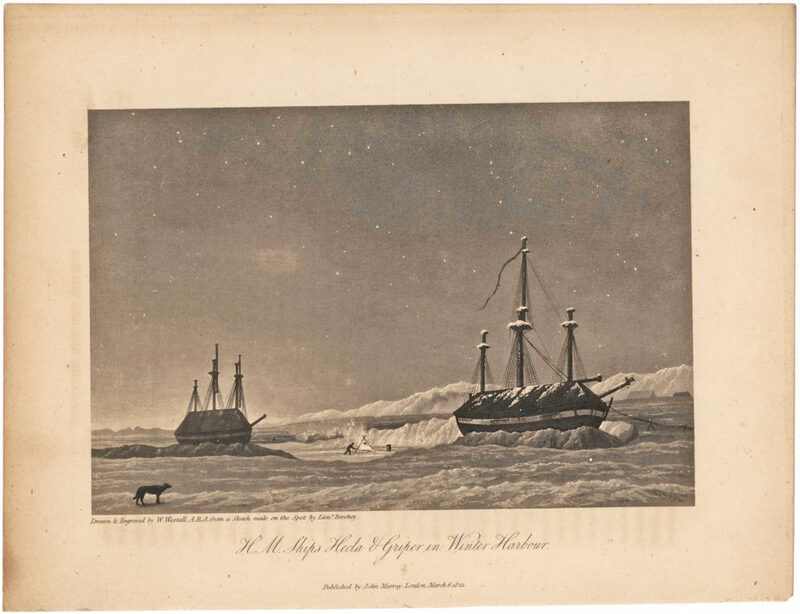 After serving four years in North America, he began his arctic voyages in 1818, under Captain John Ross, exploring Baffin Bay. As the result of a mirage, Ross mistook the entrance to the much-sought-after Northwest Passage, Lancaster Sound, for a mountain range. 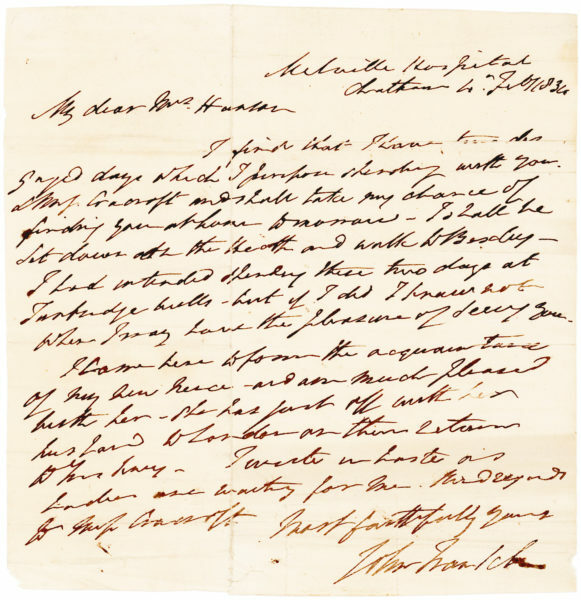 Parry and other officers, urged Ross to examine the mountains more closely, but Ross turned back. As a result, the Admiralty awarded Parry command of the next expedition, in 1819. Considered the most productive voyage of the many that searched for a Northwest Passage, Parry and his men reached further west than any previous expedition winning a £5,000 prize from Parliament. Parry led subsequent expeditions in 1821 and 1824. In 1827, he attempted to reach the North Pole from Spitsbergen, attaining a latitude of 82°45′N, a record held for nearly 50 years. For his achievements, Parry was knighted and promoted to rear admiral. In 1826, while employed as a hydrographer for the Admiralty, Parry married Isabella Louisa Stanley, the daughter of Sir John Stanley (1766-1850), first Baron Stanley of Alderley, a Whig politician and member of the Royal Society. 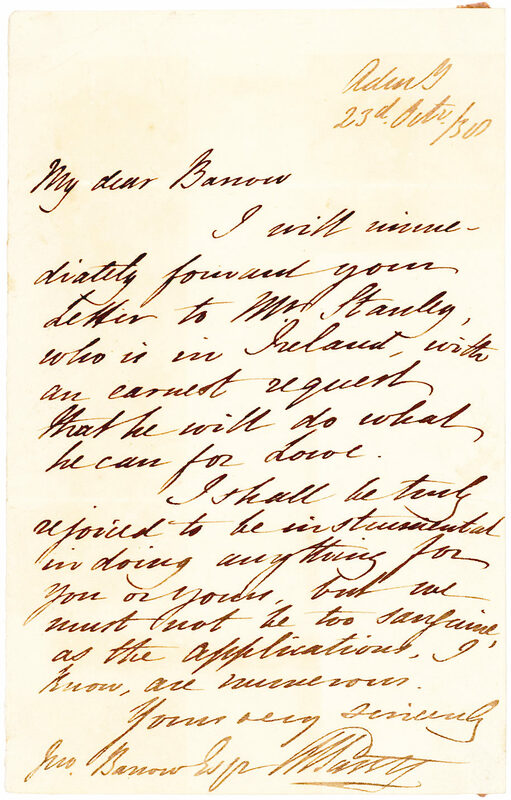 The Mr. Stanley of our letter might refer to her father, or her brothers, William Owen Stanley (1802-1884) or Edward John Stanley (1802-1869), both of whom went on to have political careers, the latter as a member of the Privy Council. While traveling in South Africa, Barrow, our letter’s recipient, produced a modern map of the southern portion of the Cape Colony, which led to his promotion as Second Secretary to the Admiralty. He held the influential position from 1804 to 1845 (with the exception of 1806-1807) and was an ardent supporter of Arctic exploration, promoting the work of John Ross, John Franklin and Parry. For his ongoing advocacy, a number of geographic features are named for him including the Barrow Straight (part of the Parry Channel and Northwest Passage), Point Barrow and the city of Barrow, Alaska.